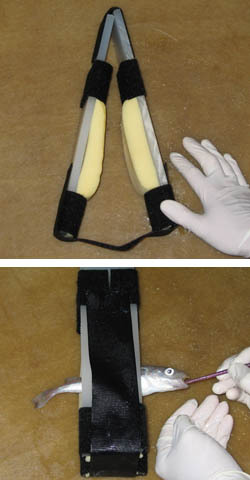 Pictures of fish restraining device (top) and walleye pollock being tested for mouth closure in fish restraining device (bottom). Photos by Michele Ottmar. Mortality of fish bycatch discards and escapees that is induced by capture or encounters with fishing gear has been a primary concern for fisheries managers for at least two decades. Mortality of discards may be immediate, which can be observed on the deck of a fishing vessel, or delayed, which is undetected. Mortality of escapees is generally undetected. Estimating bycatch mortality rates has been difficult. Fishing experiments typically estimate delayed mortality by placing fish in cages or with tag-and-recapture studies over extended periods of time, which limits the scope and replication of experiments. A different approach which increases experiment scope and replication significantly is to predict discard and escapee mortality by observing fish condition during fishing experiments rather than after an extended recovery period. Fish condition has been discussed as a general predictor for mortality, but no guidance has been given for how this would be accomplished over a range of fisheries. The International Pacific Halibut Commission developed a condition index based primarily on wounding to predict Pacific halibut discard mortality in Northeast Pacific Ocean trawl, longline, and pot fisheries. However, use of wounding, autopsies, or plasma constituents as predictors for delayed and total mortality may be limited because these measures show inconsistent responses to different types of fishing conditions including capture, environmental factors, fish size, and combinations of stressors. Reflex impairment is a measure of fish condition that responds to a wide range of fishing factors in a similar manner that is correlated with stressor intensity. Recent studies conducted by the Fisheries Behavioral Ecology Program showed that reflex impairment in walleye pollock, sablefish, northern rock sole, and Pacific halibut was related to mortality that was induced by stressors associated with fishing, discarding, or escaping from nets. A mortality predictor called the Reflex Action Mortality Predictor (RAMP) was formulated based on results of these studies. To evaluate relationships between RAMP and mortality, fish were towed in a net for various times up to 4 hours to produce a range of mortality. Three minutes after towing, fish were tested for reflex impairment either while swimming freely in tanks or while placed in a foam-lined restraining device. Reflex impairment was defined as any decrease or complete inhibition of normal baseline reflex action in live fish. Figure 1. Relationship between RAMP (Reflex Action Mortality Predictor) measured for fish in tanks at 5 minutes after towing and total mortality (proportion) in walleye pollock, sablefish, northern rock sole, and Pacific halibut. Points represent replicate groups with five fish per group. Figure 2. Relationship between RAMP measured for restrained fish at 5 minutes after towing and total mortality (proportion) in walleye pollock, coho salmon, northern rock sole, and Pacific halibut. Points represent replicate groups with five fish per group. For fish in tanks, orientation and startle responses to visual stimuli (lifting the tank cover) and mechanical stimuli (knocking the side of the tank with a calibrated strike) were noted. For restrained fish, body flex, operculum closure, mouth closure, gag response, and vestibular-ocular response were noted. Responses were scored as present (1) or absent (0) and totaled for the five fish in a replicate group. Then RAMP was calculated where RAMP = 1 (total reflex response score / total score possible). RAMP ranged from 0.0 to 1.0, representing the proportion of reflex impairment where 0 = no impairment. Total mortality increased with increased tow time, and RAMP was correlated with this gradient of mortality. RAMP for fish in tanks 3 minutes after towing (Fig. 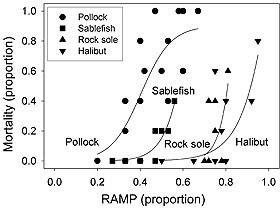 1) showed a sigmoid relationship to total mortality in pollock (r 2 = 0.55), sablefish (r 2 = 0.80), rock sole (r 2 = 0.29), and halibut (r 2 = 0.44). Prior to fish showing mortality, RAMP initially increased with tow time, reflecting sublethal stressor effects. Then RAMP continued to increase while mortality became apparent and increased. Similar patterns in RAMP response were noted for restrained fish (Fig. 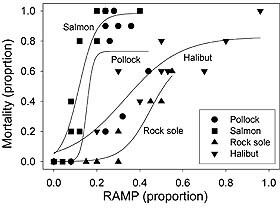 2), with a sigmoid relationship to total mortality in pollock (r 2 = 0.44), coho salmon (r 2 = 0.84), rock sole (r 2 = 0.93), and halibut (r 2 = 0.83). RAMP for discards in the field should ideally be measured on individually restrained fish as this would not require the use of tanks on board vessels and could be performed rapidly on numerous replicates through the course of discarding. RAMP for escapees should be measured on fish in cages at depth shortly after escaping from fishing gear. Reflex behavior could be observed using cameras mounted on the cages. Relationships between RAMP and mortality could be validated by observing RAMP for species of interest in future fishing experiments that use tanks, caging, or tagging to estimate delayed mortality. Once validated, RAMP can be used to predict delayed and total mortality for individual species in extensive fishing experiments without the need for further caging or tagging. Because RAMP can predict mortality over comprehensive ranges of fish size and fishing-related stressors, differences in stressor intensity and mortality between fishing practices, conditions and fisheries can be evaluated for individual species. RAMP may be a powerful tool for investigating the efficacy of bycatch reduction devices and practices, as well as estimating fishing mortality associated with bycatch. The ability to estimate sublethal and lethal effects of seemingly unlimited combinations of fishing-related stressors using RAMP would greatly enhance our ability to model bycatch discard and escapee mortality in fisheries and to reduce uncertainty in estimates of fishing mortality associated with bycatch.